He Fu is from Guangdong province in southern China. He was born in 1974 in a remote village which cannot be found in the map. He’s childhood memories are scenes of farms and fields, rivers and hills, the sun and the moon. Since there was not much entertainment in the countryside, He started to paint when he was a boy. When He grew up, he is so obsessed by the big cities that he decided to move to Guangzhou to practice his painting skill. He has inexplicable love for metropolitan. No doubt, he knows the countryside too well and now he wants to explore the cities. “To me, cities are just like zoos. Everything is so distorted, nothing but real,” said He. 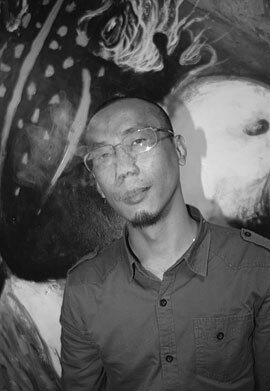 He is a professional artist residing in Guangzhou’s Xiao Zhou Cun art district. He is specialized in oil painting and water color. Since 2008, He’s paintings are popular items in major exhibitions and art auctions in China.